The Waltham Committee at Brandeis connects with Brandeis students and faculty in many ways. One of the programs offered, is an engaging, immersive academic program in which small groups of students explore a thematic topic through inquiry-based courses linked to real-world experiential opportunities. It provides them with opportunities to deeply engage in law, social impacts and the immediate needs of environmental health challenges facing individuals and families today. The students work with some of the most disadvantaged communities from inner-city Boston and Waltham to the rural coal mining mountains of Appalachia, as they learn and combat issues such as toxic exposure, access to safe housing, healthy food and open space. With faculty member Laura Goldin’s leadership and experience these students receive the training for hands on multi-disciplinary community engaged learning program. In that connection she invited Rajashree Ghosh, as before, to present her work on urban governance and women in India. This gave the students an understanding of gender issues, poverty, deprivation and the community based initiatives that work on the ground to make changes to the lives of impoverished populations in slums in Delhi. Her presentation was followed by comments and questions by students. The conversations ranged from doing fieldwork in another country, government practices, women’s role, community engagement and many other issues that struck the students as key in the understanding of the project. 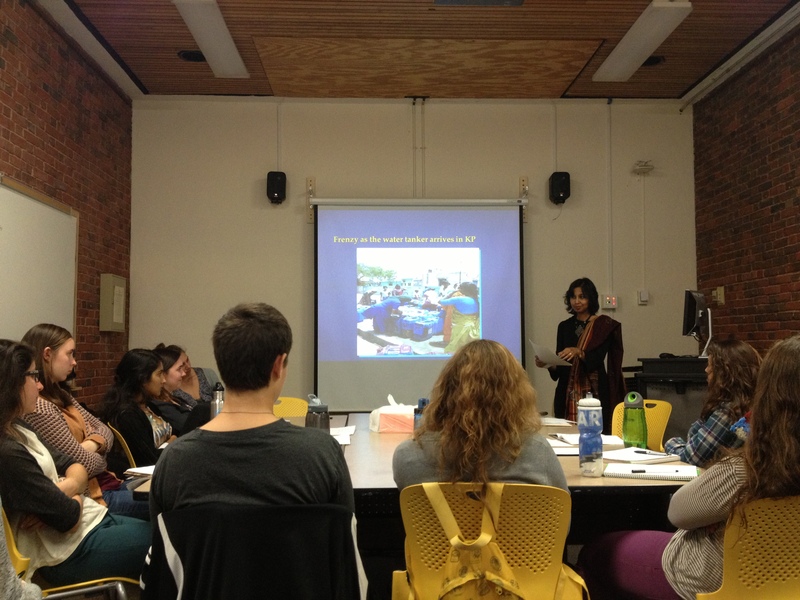 In a note sent, the students said that they found the presentation “informative and encouraging.” For Rajashree and members of the Waltham Committee, this connection with the students and faculty member is an extension of the relationship with the community. As with the larger Brandeis community, WSRC through the Waltham Committee engages with the local community and determine ways in which to make a difference.